If this is your first time buying Pixie Epoxy, please read the description and directions below first. The world's first cosmetic sparkle adhesive! This is not an eye shadow primer, or really a base. 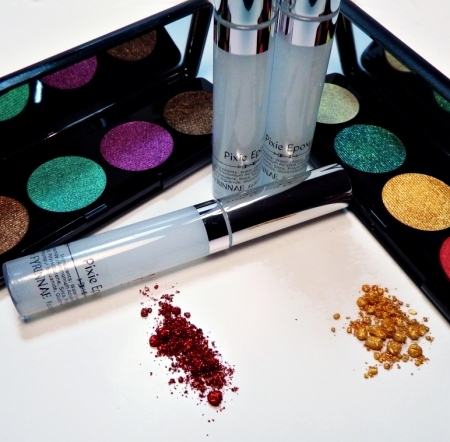 Originally developed and formulated in 2007, this unique "glue" is designed to hold the sparkliest eye shadows of any brand in place hours longer, and minimize sparkle "fallout". It's easily washed off, and while keeps shadows in a water-resistant state, the product itself is water-soluble (no silicones or oils). This product is not a requirement under any of our shades, but it will help to keep your finished sparkly look tidy for hours. Packaged in a lipgloss tube/doefoot wand, all you need is a tiny amount rubbed on with fingertip over your usual primer. Wait about 3-5 seconds, as the Epoxy should still be damp, and apply dry loose shadow. More Epoxy may be desired for very glittery products, and for easier blending, just apply a little more shadow or dilute a dab of the product first (on a separate clean surface) by mixing a drop of water in. This product also enables the shadow to be brushed on rather than patted. Translucent in the tube, applies and dries completely clear. May make some shades appear darker, and doesn't work well with mattes (but mattes lack sparkle so it's not needed). To help prevent creasing, use an actual shadow primer under this. Pixie Epoxy is safe to use under eyeliner, but not recommended for application directly on the waterline. Our customers use this under pressed eye shadow as well as loose. Can also be used to safely adhere glitter to lips or face. 10 ml tube, which holds approximately 9ml of product. Trial size is 1.3 ml. This style of container is used because it's easy to keep clean: just rinse off the wand (and wipe down top of tube as needed), dry, and replace cap. Please limit 3 tubes. Ingredients: Water, Glycerin, Propylene Glycol, Less than 2% of: Polyacrylate-13, Polyisobutene, Silica, Polysorbate 20, Carbomer, Polyaminopropyl Biguanide, Gluconolactone, Sodium Benzoate. Shelf life: 24-36 months on average. Once opened discard after 3 years or if product changes. A full size tube is enough to last the average user over 1 year.